Hazard-free and low cost disposal due to usage of non-toxic, recyclable materials and lightweight (under 8kg), small footprint design. Major IT cost reductions over desktop PCs as small footprint, All-in-One design allows for faster installation, relocation and operation at user's location - a traditional desktop PC requires installation and configuration of two pieces of equipment (CPU tower and Monitor). Take your IT support to the next level, by supporting more users per each IT staff member. Highy flexible, fully customizable and upgradeable design to meet departmental and/or individual computing requirements i.e. Processor, Hard Drive, memory or optical drive. Optional Touch Screen and Privacy Filter available. Test-drive the EUROCOM in your data center and see what eco-responsible PC can do for you. 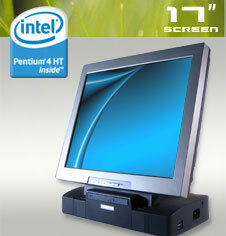 There has never been a better time to try the world's first Eco-Friendly EUROCOM All-in-One PC! Powered by Intel Pentium 4 processors with H/T technology, EUROCOM LCD PCs are the industry's fastest, most space and energy efficient PCs, ideal for all IT environments.